If you are looking to refresh or replace your outdated fireplace, you have come to the right place. From luxurious marble to eye-catching tile these fireplace ideas from our favorite interior designers and bloggers will ignite your inspiration. For nearly a decade Kate, an avid renovator and decorator, has been dishing out expert interior design advice on her blog Centsational Style. Here she shares how this fireplace built in the 1980s was made over with beautiful patterned cement tile. It took 34, eight-inch square tiles to get the job done with the help of 1/4 inch spaces. Before getting started she removed the original drywall mantel. After installing the new tile, she added a new wood mantel. No one would ever guess that your fireplace is builder grade with this clever DIY by Amanda Hervey, one of the three bloggers who writes for Our Storied Home. She used colorful Bali Turtle Pebble Tile in soothing blue and green shades to transform a beige hearth into an ocean-inspired fire surround. It took roughly eight, 12- inch sheets of the pebble mosaic tile to complete her project. Hervey suggests you can use leftover tiles to makeover other objects in your home like an old terra-cotta planter. 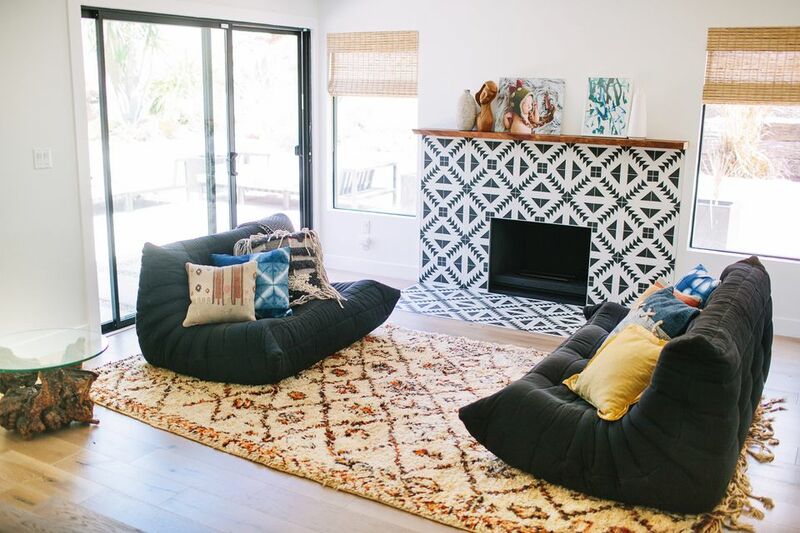 Veneer Designs based in Los Angeles, California enhanced this living room's chic, bohemian vibe with a new fireplace covered in Moroccan concrete tiles in an eye-popping geometric pattern. Shake things up at home by painting an old, red brick fireplace a bold and unexpected shade. Jennifer, the crafty do-it-yourselfer behind The Suburb Experiment, pulled off the look of Staffordshire brick, which is a gorgeous shade of blue, using paint. The trick behind this project is using paint to tint the bricks instead of thickly covering them with flat color. To do the blogger combined one part blue paint and one part white paint with around four parts of water. Then she applied the homemade color wash to each brick using a brush. Then, before the paint dried, she wiped off the excess color using a clean, dry rag. A gorgeous slab of charcoal marble turns a traditional fireplace into a modern focal point in this home remodeled by Watts Studio situated in Australia. Notice the hearth pad? It was cut from the same slab. Contributing to the room's bold yet minimalist aesthetic is the low profile furnishings. The red velvet armchair punches things up with a bright pop of color. San Francisco, California based Phase 2 Builders remodeled this spacious home. The new gas fireplace has a porcelain tile surround that resembles reclaimed wood. Painting a red brick fireplace white is a clean, modern, and timeless idea as shown with this newly built example in a modern farmhouse inspired den by Erin and Kirsten, the interior designers behind House of Jade Interiors based in Utah. The fireplace was constructed using reclaimed bricks. The duo points out that brick is super porous and it will take multiple coats of paint to cover adequately. For a pinch of contrast, the hearth pad features black and white square tile laid out in a harlequin inspired pattern. From countertops to furniture over the last couple of years, concrete has become a popular material when it comes to interior design. In this living room by Calabasas, California based Sharon Taftian Interior Design a concrete fireplace brings both practical function and enduring style. We love this rustic inspired fireplace by Instagrammer Nelly Friedel that fakes the look of distressed painted brick using a faux antiquing treatment called the German smear. It is a type of color wash for mortar that duplicates the look of centuries-old brick homes found in Europe. Create a stone fireplace surround for much less than you think using stacked stone panels crafted from natural stone like marble as shown in this example by Jodie Rosen Interior Design out of Toronto, Canada. Panels like these are only around one-inch thick, making them much cheaper to buy than solid stone bricks. An old nonworking fireplace does not have to an eyesore anymore. Here Julia Goodwin an interior designer and the voice behind the blog My Manicured Life shares how to refresh an old hearth using paint to fake the look of chic subway tile. Afterward, she finished off her completed project with decorative birch logs. You can also use paint to give a working gas fireplace a lift. Brynne Delerson, the décor enthusiast who pens The Gathered Home used Amy Howard One Step Paint in black to perk up her white hearth. It is important to note, that the paint she used is not heat resistant. That is because gas fireplace surrounds do not heat up like traditional wood-burning fireplaces. Fans of Craftsman style will love this idea spotted on Mercury Mosaics' blog. The fireplace features a mix of square and rectangle tiles in harmonizing shades of blue to create a Frank Lloyd Wright inspired fire surround. Revive your fireplace with a fresh hearth pad. Camila, the do-it-yourselfer from Effortless Style Interiors replaced her old brick hearth pad with Moroccan lantern tile in white. To make the tile's pretty design pop she painted the grout orange. 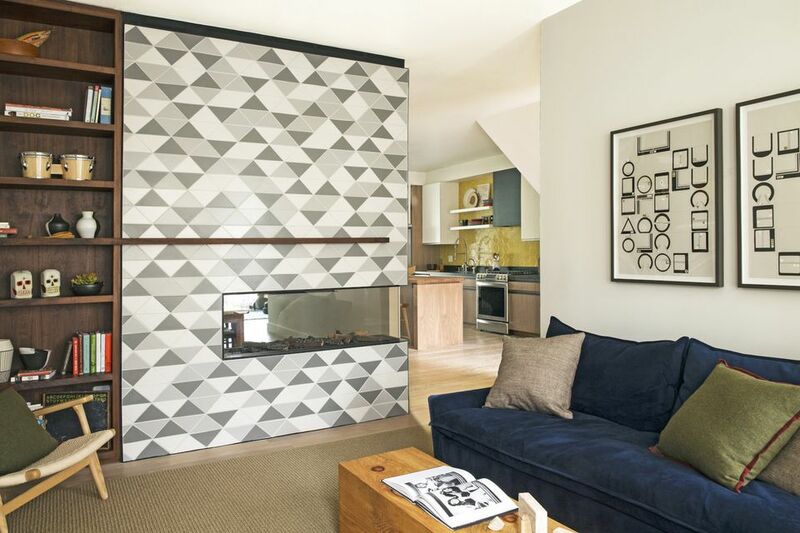 A small electric fireplace becomes a dramatic feature courtesy of a geometric tile surround that doubles as a feature wall in this modern space by California based interior designer Lynn K. Leonidas. The two side tile wall and fireplace add ambiance, warmth, and style to two different rooms in the home.